The Australia China Business Council is delighted to launch the China Market Insight Series - a program dedicated to delivering cutting edge research developed by ACBC and industry members to identify business opportunities for South Australia in engaging with China. The China Market Insight Series will analyse 5 sectors of agribusiness, property, education, tourism and health services in the form of industry roundtables with final reports to be launched at ACBC’s State of the State event in December. How do Chinese students hear about SA & what influences their decision to come? Where do Chinese students: … holiday? … buy houses? …go to for help? 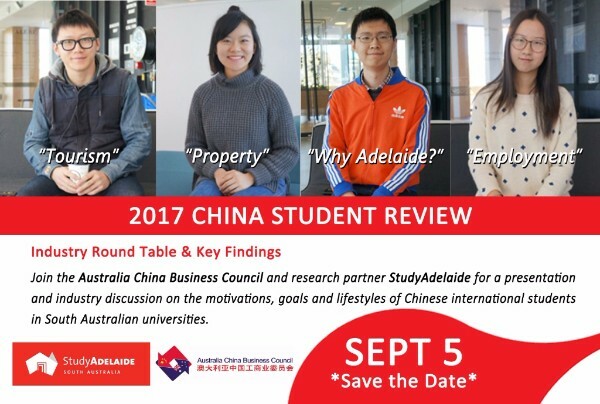 Join the Australia China Business Council and research partners StudyAdelaide for answers to these questions and many more as we share key findings from our Chinese-language, qualitative study that researched the lifestyles, motivations and future plans of Chinese international students currently studying in South Australian universities. Networking drinks will follow participant discussions.